~~> You’re the new girl in school, and you’ve decided to try out for the cheerleading squad! ~~> Join the squad and show ‘em what you got! 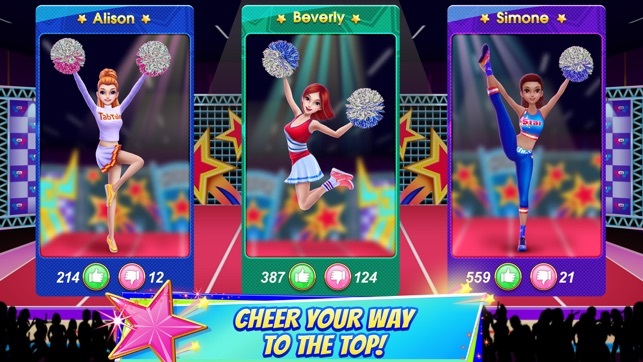 Your dance skills will help you become a cheerleader pro, and maybe even captain! ~~> Help your squad win first prize in the big cheerleading dance off! You just joined a cool new school, where being a cheerleader is like being a celebrity! You’ve just got to join the cheerleading squad! The squad will thank you for teaching them all your great dance moves! You’ll even get to choreograph the cheerleading routines! Help your squad win the trophy and beat all those other squads in the big cheerleading dance-off event of the year! 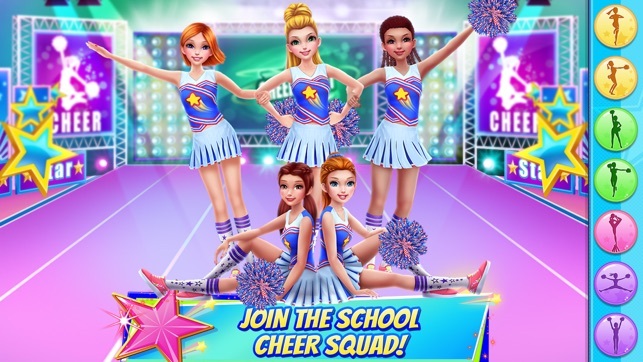 > Try out for the cheerleading squad at your new school – they’ll be begging you to join them! > Become a cheerleading superstar! Your new bestie is the cheerleading captain, and the captain of the basketball team is SO cute! Will he notice you?! > Get ready for the cheerleading dance-off event of the year! 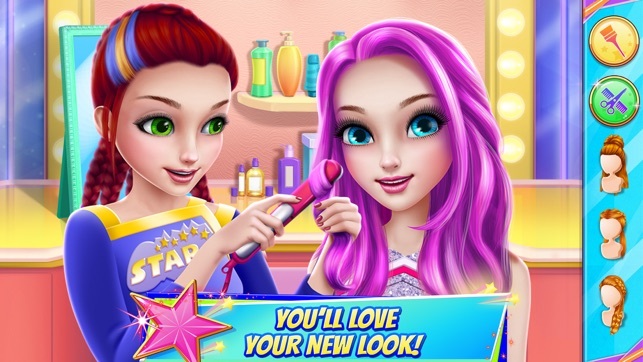 Get a killer makeover and a beautiful hairstyle! > Work out at the gym to build up your cheerleader muscles! > Oh no! You got a cheerleading injury! Go to the doctor and get better before the competition! > Getting a little nervous? Relax at the spa before the cheerleading competition! 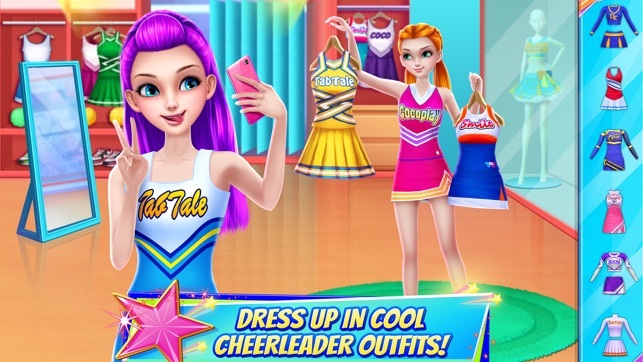 > Dress up in the coolest cheerleader outfits ever! > Decorate the stage for the big cheerleading dance off contest! 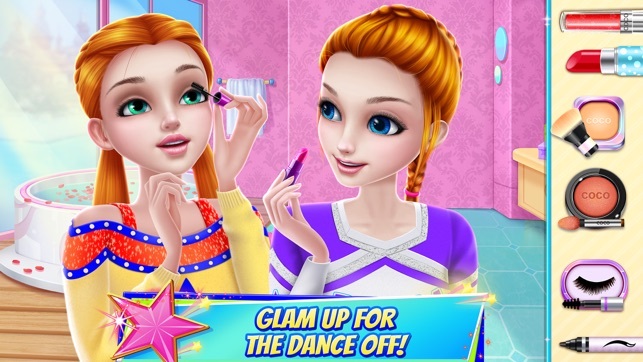 > Choreograph your squad’s cheerleading dance routine – they’ll love it! But will the snobby judge? > Keep your eyes on the 1st place prize, and cheer your way to the top! > Dance ‘til you drop with a dance minigame! > BUGS?! Not on our turf! We evacuated all the creepy crawling intruders. > We made some improvements to the game - it's now better than ever! Who is this?! And why is this a kids game? I am in the "superstar" area, I have the full version, and my team StarSquad is in the 1st position. I have one question though, that makes me quite skeptical about this app. On the leaderboard I should be in the first position, but instead of showing the team names whenever I open it, there is this team called Lightling Lofts in all of the positions! Well, one day I got fed up, deleted the app and reinstalled it. I only got to that position again when the app crashed and made me loose all my data! When I finally got to this SAME EXACT position A YEAR LATER I realized my team name had changed to the N.P.C Lightling Lofts team name. When I changed it back to StarSquad it told me there were too many characters in the name, but when I tried Lightling Lofts It told me the name was already taken by the computer. That experience was very creepy, and ever since, I have not touched the app, and that was now 3 YEARS AGO!!!!! So I have one question, Who is Lightling Lofts???? One other thing.... there is this "skin tone" issue I have been having lately, and I have noticed this in ALL the Coco play apps I have.. including this one, even if I have the lightest skin available, it always shows up deep brown! What the heck is that about?!!!!! I want my money back.